This is a humanoid robot, which means it looks, it talks, and it even acts, well, like a human. So does that mean it could take a human's job like mine? The rise of robots has led to some pretty scary warnings about the future of work. Robots will be able to do everything better than us. And that number is likely to go up. 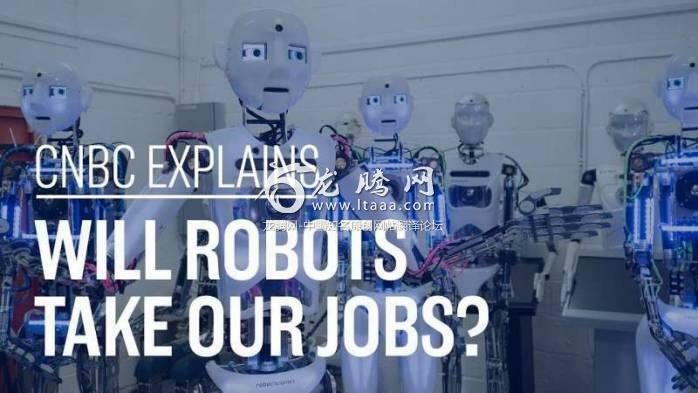 A widely-cited study from 2013 found nearly half of all jobs in the US are in danger of being automated over the next 20 years. Occupations that require repetitive and predictable tasks in transportation, logistics and administrative support were especially high-risk. And just think, robots don't need health benefits, vacation or even sleep for that matter. Why? You guessed it. The automobile came along. Car mechanic and repairman jobs surged even though railroad jobs began to disappear. And some companies say the same thing will happen when robots move into the marketplace. A survey of 20,000 employers from 42 countries found that the IT, customer service and advanced manufacturing industries will add workers over the next two years as a result of automation. It's hard to imagine that robots could replicate human characteristics, like empathy or compassion, that are required in many jobs. I mean, would you really want a robot as your nurse, babysitter or teacher? But even if robots don't take our jobs entirely, research shows they will significantly change day-to-day tasks in the workplace. This is particularly a problem for lower-skilled workers who aren't able to retrain for new jobs.